Generally speaking, a tonneau is an area of a car or truck open at the top. It can be either a people or cargo space. A tonneau cover signifies a hard or soft cover, designed to protect unoccupied passenger seats in a convertible or roadster, or the cargo bed in a pickup truck (Source). Another thing the tonneau cover does is conceal or cover the cargo. When the cover is pulled out, it keeps items out of the sun and provides additional security by keeping personal belongings concealed. This retractable truck bed cover by Retrax fits F-150 Super Crew and Super Cab 5.5-inch Bed (15 and above). Before you proceed with your purchase, make sure to provide the seller with enough information to let them know that the selected product fits your vehicle. Most of the tonneau covers currently on the market are relatively heavy and difficult to handle. However, opening and closing the Retrax 60373 ONE MX is a breeze, as the company uses a radically new technology, based on sealed ball bearings. This tonneau cover is surprisingly lightweight, yet it is extremely durable and therefore – reliable. 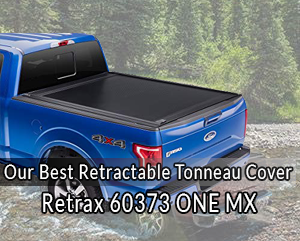 The RetraxONE MX is a retractable truck bed cover that combines strong, durable polycarbonate with a super scratch-resistant matte finish. The RetraxONE MX boasts a low-profile patented design that streamlines the overall appearance and provides a firm seal. The RetraxONE MX can be locked in any position along the rail. It is made from polycarbonate – a super tough thermoplastic commonly known as LEXAN, which is reinforced with a number of aluminum rods. This unique construction is designed to keep your cargo safe and secure even in the most extreme weather conditions. The RetraxONE MX also features a spiral track storage canister that prevents the cover from rubbing on itself as it retracts and closes, while at the same time it does not obstruct the access to your cargo. The RetraxONE MX glides easily with the the sealed ball bearings, and you do not need a power drill to install it. The secure key-lock system offers protection that no other soft cover can provide. To access your pickup bed, simply release the flush-mounted latch with the touch of a button – no key is necessary – and the cover slides out of your way without any effort on your part. The cover can also be locked open in any position along the rail, thus allowing unlimited hauling flexibility and convenient use with any fifth-wheel trailer. 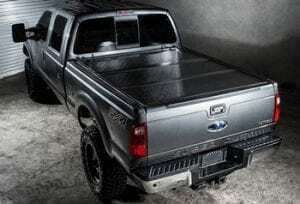 One of Lund’s very best tonneau covers currently available on the market. The LUND Genesis Elite™ Tri-Fold Tonneau cover has a low-profile design and boasts premium twill weave HAARTZ™ fabric. It is made to be resistant to water, mold, mildew, UV, dirt and dust. The Genesis Elite Tri-Fold design mixes the flexibility of a Tri-Fold with the performance of a full, one-piece seamless cover to protect your precious gear or cargo. The Genesis Elite Tri-Fold also features a durable, black powder-coated aluminum sub-frame, a commercial-grade clamping system and a tailgate seal. The Genesis Elite Tri-Fold allows full access to your entire truck bed with an integrated clip and strap system that enables the vehicle to operate with the top in the open or folded position. This cover comes fully-assembled, requires no drilling or special hardware, and can be easily installed in less than ten minutes. Each Genesis Tri-Fold is custom-made for a precise fit, depending on the specific make, model, year and bed size of your truck. Lund is proud to announce that this model tonneau cover is manufactured in the USA and has a limited lifetime warranty. Limited, as the warranty is restricted to the product’s first owner only. Gator’s tri-fold tonneau cover is a simple to use, affordable, and durable soft folding truck bed cover, 100% American-made. 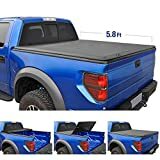 It fits best F150 5.5 ft. bed 2015-2017. This tonneau cover unlocks from underneath and the tailgate lock keeps your stuff secure and out of reach. The manufacturer guarantees that this tonneau cover is perfectly capable of eliminating dust, rain and snow. It protects the inside of your bed and cargo from the elements by providing a tight tailgate seal. Along the frame of the cover there are additional seals that will prevent moisture from entering the bed. This product also comes with a limited lifetime warranty on the frame, valid for as long as you own it. It also has a ten-year warranty on the vinyl. The vinyl is supported by an aluminum frame and cross-bows for extra strength. It sits on top of the bed rail to help keep water out of your truck bed. As bed seals may vary by make and model, measure your truck bed from bulkhead to tailgate before proceeding with your purchase. The fastening buckles make it possible for you to drive down the road safely with the cover securely fastened open. It does not matter if you are hauling cargo or just cruising around town, the cover stays absolutely secure. The quick latch system ensures tool-free installation in less than fifteen minutes. The quick latch is simple and easy to use. You can adjust it by hand for the perfect fit. Tyger Auto’s TG-BC3D1015 TRI-FOLD Truck Bed Tonneau Cover boasts a 100% American design and manufacturing. The company focuses on developing premium aftermarket auto parts, including tonneau covers that meet or exceed OE quality standards. Tyger’s soft tri-fold tonneau cover comes fully assembled for easy installation. The cover folds easily for quick access to the truck bed and also provides extra protection to your valuable cargo with a tailored look. This soft tri-fold tonneau cover mounts on top of the truck bed rails. Its sleek design offers 12% gas savings on average. This model features heavy duty front clamps that directly attach onto the bed rails, offering maximum security. Its patented quick release rear latches make it easy for you to access the truck bed in one simple step. The safety buckles help to secure the cover in place when it is folded completely to the cab. “Shipping was swift, and the top arrived fully assembled except for a few minor tweaks. Due to the width of my truck bed, I had to caliber the mount spacing, which was done by just moving two screws. My son and I had it installed in a quarter of an hour. Since TG-BC3D1015 is a universal top, most of our time was spent deciding on its exact position. I like best that it provides a proper overlap of the edges, and fits tightly at the corners. It was really as simple as setting the top on the truck and pushing it into place. ZipRail Tonneau Covers use the same Belt Rail System technology that Bestop patented for Jeep soft tops. It is extremely secure and provides full-length continuous sealing along the side rails and on the rear tailgate bar. It also incorporates aluminum support cross rails right into the fabric for a smoother appearance and swift installation. The cross rails remain flexible in any weather, so you can use your tonneau even on the coldest days. The installation does not require any power tools and takes less than fifteen minutes with the clamps included. The fabric has a semi-rigid extrusion that simply slides into the Belt Rail channels on the side rails and the tailgate bar. Quick, easy and secure! With fabric rolled up to the cab, you enjoy full access to the bed. This tonneau is made of durable, top grade, leather-grain, vinyl-coated polyester that can withstand any rough weather conditions, and it is also mildew, and UV-resistant. Thus, it helps protect cargo in the truck bed throughout the whole year. The highly reliable Belt-Rail attachment system attaches the Tonneau cover securely and quickly to the truck bed, while the peel-back, non-snap closure featuring quick release tabs makes for fast and easy open and close. It should also be mentioned here that this tonneau reduces drag and helps improve gas mileage. Are you looking for functionality, security, superior design, versatility or easy removal? Both hard and soft tonneaus are offered in folding, retracting and hinging designs. A hard retracting or soft roll-up cover can quickly be opened for full truck bed access, without removing the cover. Soft and hard hinging tonneau covers can be lifted open, but they require some extra effort, if you need to fully remove them. 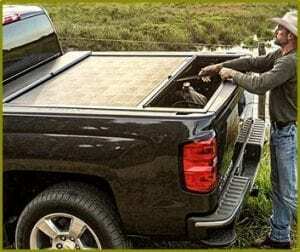 Soft folding tonneau covers can easily be fully removed or folded forward for truck bed access, whereas hard folding tonneau covers can also be folded forward for bed access, but generally are more difficult to remove. Most models are installed in about one hour by someone with limited technical skills. Remember that all covers work best only if they are properly installed. If you fail to line up a rail correctly on a roll-up tonneau, it may be more difficult to close. Likewise, if you miss the right seal placement on a hard tonneau, it may not be fully waterproof. Soft tonneau covers tend to be a bit easier to install than the hard models. The Tonneau is one of the most important pickup truck accessories, especially if you are using your vehicle throughout the year. Whether you are using your truck for work or leisure, no truck is fully functional or complete unless it has a tonneau. However, a tonneau cover can be a tricky purchase. Having read our review, you can now be sure that you are fully capable of making an informed choice.